In the spirit of the holiday season, we have been scouring our records to uncover a host of festively named forbears. There may have been no room at the inn on the very first Christmas Eve, but in 1871 there was certainly room at 196 St Thomas Road, Mile End. There, Mary, Joseph and their young son Jesus would have spent the night warm in bed rather than in a stable complete with manger. According to the 1871 England & Wales census, 196 St Thomas Road was not the sight of some holy event, but rather the home of the Horn family. There Joseph Horn, a rope maker from Bow, lived with his wife Mary and their son Jesus who was not born in Bethlehem over 2 thousand years ago, but Plaistow in 1863. While the Angel Gabriel announced the birth of Jesus Christ, an Angle called Gabriel from Somerset missed the birth of Jesus Horn by 8 years. Gabriel Angle was born in Bath in 1855 and grew up to become a cabinet maker. It seems that a large number of Marys had a love of all things festive and this was reflected in their choice of husband. There are over 50 Mary Christmases in findmypast’s marriage records, with the earliest recorded Mary Christmas marrying in 1837 in Alton, Hampshire, losing the maiden name of Cannon. The marriage records contain a number of merry pairings. In 1956 there was a Christmas – Tree wedding in Hove, Sussex when Peter Tree married Joan Christmas. In 1853, a Sudbury church saw Edwin Christmas and a Louisa Cardy joined in holy union while in 1839 there was a Ball-Ball wedding in Chatham. None sound quite as idyllic as the White-Christmas wedding that took place in Midhurst, 1849, when Caleb Christmas took Thirza White as his Bride. Our census records contain yet more seasonal themed names. There was probably little Christmas cheer at the Lewisham Road Workhouse despite the presence of 8 year old inmate, Ivy Holly in 1892. At a house on Potters Row, Stirling, in 1851 it is possible that occupants Agnes and William Thompson spent the Holiday with their lodger, a mister Iron Tinsel, while in 1801 a Mary Mistletoe was living in Guildford, although it is unclear if her name earned her kisses as she does not appear in any marriage records. 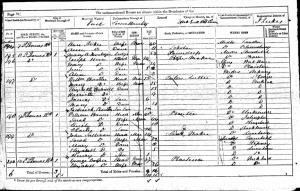 In 1901 a Carol A. Christmas lived at 129, New Colney Road, Dartford and Baptism records from the Parish of St John in Wapping shows a Mr Scrooge was born on the 25th of December 1663. This Scrooge’s birth date seems rather Ironic when considering what his fictional namesake thought of the holiday. Children in France will wait all year for the arrival of ‘Pierre Noel’, but children on the Island of Jersey were probably not that fussed about local resident Pierre Noel who appears in both the 1901 and 1911 censuses. Could it be possible the jolly man in red himself is an Englishman? Parish records show that a Nicholas Saint was baptised in Whitechapel in 1787? In Plymouth, an Abraham Grinch was baptised in 1868 and while the date and place of his baptism are clear to see, his opinion of the festive season remains a mystery.